Iberian Warmbloods are sport horses that have a minimum of 25% Andalusian and/or Lusitano bloodlines from one or both of their parents. The ancestors of these horses include the primitive Sorraia horse, which around 900 B.C., was mixed with horses from Northern Africa. The Sorraia, perhaps the oldest breed of horse, is depicted in early cave paintings found on the Iberian Peninsula. Breeders of dressage and show jumping horses have long been seeking a way to breed a horse with greater sensitivity and a greater ability for the collection required for piaffe, passage, and jumping. The Iberian blood strengthens the horse's soundness, athleticism, and versatility. When bred to other breeds with the big stride for dressage, or the power and speed for jumping, the result is the Iberian Warmblood. Light horses are grouped in a couple of different ways, one being the continent or country where they originated from. They are also grouped according to training, classified as a stock type, hunter type, saddle type, or 'other'. A body type is generally attributed to each class, with the 'other' classification being a bit of an odd ball. It includes those that are color breeds or those that may fit a body type of one of the training classes, but not be used for that type of training. In some cases the 'other' types can also include those that may fit into more than one of the type groups. 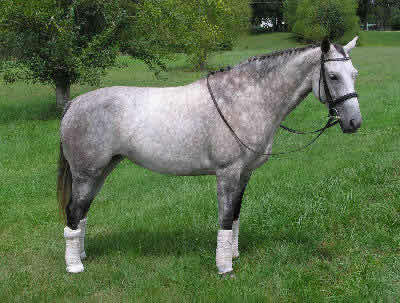 Iberian Warmbloods are a sport horse, the horse class the Iberian Warmblood fits into is the 'hunter' type class. They are developed for performance in disciplines such as eventing, dressage, and show jumping. Iberian Warmbloods have a long sloping shoulder and a well muscled, long arm bone giving them increased ability in lateral movement and jumping. They exhibit great ability to flex its joints and bring their legs under their center of gravity. They have good bone density and a short canon bone with the hock slightly higher than the knee. They have large, powerful joints with the stifle slightly lower than the elbow and in line below the point of the hip. They have a tractable, intelligent demeanor. Most often they are between 15 to 16.2 hands high and are found in a color. Because of their intelligence and curiosity, Iberian Warmbloods have a talent for opening gates and getting into trouble if kept in an unsafe environment; precautions must be made to "horse-proof" their living quarters. A good vitamin and mineral supplement as well as plenty of fresh hay and water should be made available regularly as they will burn off calories quickly due to a diligent work ethic.